As we head into the weekend it feels like summer has really began, even though it officially happened a few days ago with the Summer Solstice http://pixiedusthealing.blogspot.ca/2012/06/summer-solstice-nurturing-light.html. But today marks the beginning of a Holiday weekend in my part of the world. It's also, officially, the last day of school, and that alone is cause for celebration in my opinion! My wild rose, that joined the potato patch all on it's own, is in full bloom. The incredible wonderful smell is everywhere these days. So it feels very "right" to be writing about this flower. The wild rose seems to be a symbol of summer as well. 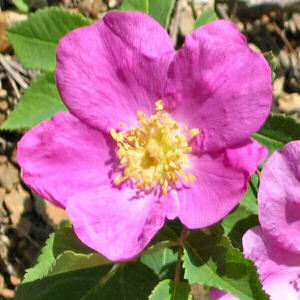 Wild Rose is a Bach Flower essence. It's main indication is to balance a sense of apathy or resignation, but as with all Bach Flower essences, the story goes much deeper than that. As Barnard explains, the Wise Woman caused everyone in the castle to fall asleep for a hundred years. With everyone sleeping, and no one tending to the garden, the wild rose bushes grew up all around the castle tower. The rose thorns were the dimise of many a hopeful Prince that attempted to climb the tower, kiss the Princess and release the spell , and probably her father's wealth as well! But once the rose was out in full bloom, one Prince, that apparently was hardy enough to withstand a few thorn pricks, was able to make it through the bushes, climb the tower and awake the Princess. They of course found true love and lived happily ever after. The symbolism, according to Barnard, may be that Dr. Bach chose the Wild Rose Remedy for those who become apathetic and allow their will to fall asleep. A few drops of the essence and your purpose may become clearer and you find the motivation to wake up and take an interest in things around you. But the idea of a Wise Woman casting that sleeping spell instead of an evil witch really makes me reconsider the tale and take a look at Wild Rose in a different light. Perhaps that Wise Woman really knew what she was doing. Perhaps it was a gift to allow the Princess some time to "sleep off" all those false alarms from guys that weren't hardy enough, or motivated enough, to make it past a few thorn pricks. Maybe Wise Woman really understood the value of taking some time to relax and allow external forces to get caught up with you. Since I started writing this blog I've really noticed the cyclical nature of life. Almost a year ago to the day, I was writing about Wild Rose. http://pixiedusthealing.blogspot.ca/2011/06/bach-flowers-for-kapha-dosha.htmlThat earlier post talked about the Kapha Dosha and how people with this personality are slow and steady. They are calm, unflappable, people. If out of balance, the Kapha personality can benefit from the boost of Wild Rose to get them out of an unpleasant situation they may have become resigned to. It's the motivation factor that gets you off the couch to change the channel to something you like better when the remote control has run out of batteries. We often focus on the negative aspect of the Bach Flower remedies. That's the easiest way to identify what you might need- by focusing on what isn't quite right. But all the remedies have postive aspects as well and it's the balance in the middle that is important for true peace. The postive aspects of the Wild Rose remedy is that you accept responsibility for your life and circumstances and use your initiative to make changes. In Sweet Shack and Bach Bar, Norma needed some Wild Rose to balance her Crown Chakra and reclaim the meaning in her life. http://pixiedusthealing.blogspot.ca/2012/02/sweet-shack-bach-bar-book-review-from.html But it isn't an impatient drive to succeed, forcing others to change or do what you think they should do. It isn't a frantic search for meaning and action. It's about having the will to change what needs to be changed while maintaining that steady, calm, easy going nature that allows you to enjoy exactly what is in front of you. I'm not a big believer in waiting for princes http://pixiedusthealing.blogspot.ca/2011/12/cinderella-meets-cowboy-boots-and-text.html, but I am a big believer in Wise Woman knowledge. So I'm thinking that Little Briar Rose's Wise Woman saw what the princess needed at that point in time was a good sleep. It was the chance to just lay back, settle in, and wait for some other people to get their act together. Sometimes we just need to let the roses grow without messing around with them, pruning them back, or trying to invent versions that don't have thorns. I figure it's no accident the wild roses come out in full bloom at the beginning of summer. I figure it's a symbol to settle into the beautiful weather. It's nature telling us to relax and just let things be, and let things grow. A long weekend doesn't mean you have to "do" a million things to get caught up from a busy year of school and work, goals and objectives. A long weekend means you can sleep later, go to bed earlier, enjoy the easy company of friends. I think that might be a good motto for the whole summer season. Let the Wild Roses bloom and the path will be easier!